Funerals are often melting pots where far-flung family members are reunited for the first time since the last significant event, and in For The Love of Cousins, we see seven semi-friendly cousins meet just before the funeral of their mutual and much-loved grandmother. They are a mixed-bag of characters, with different stories and relationships with each other, and as the piece unravels, we learn more about each one – their secrets, their prejudices, and vulnerabilities. While there is no compelling narrative overall, where Blazing Hyena’s production really succeeds is in the overall feel of the piece and the clear sense of family the company really creates – the use of repetitive jokes, the ganging up and snipping at each other all feel very genuine. Truths come out and perspectives change over the course of the action, all of which are presented humanely and sensitively. 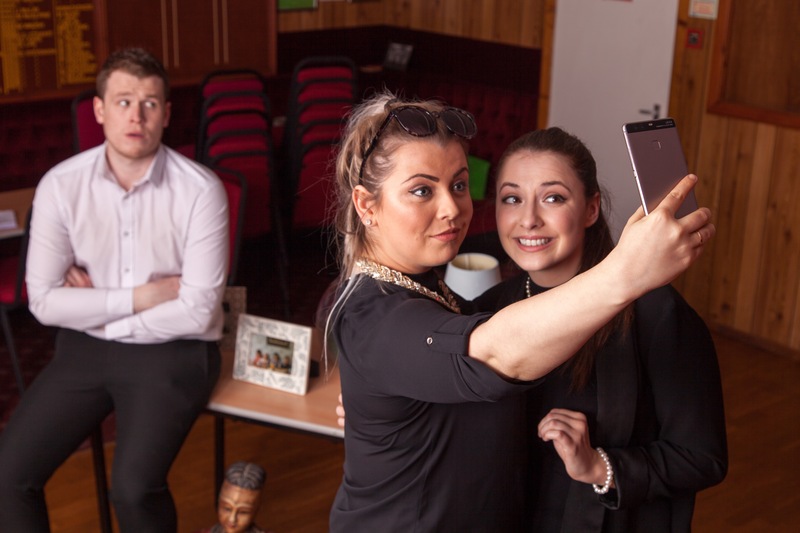 For a play that centres around family members about to attend a funeral, it is packed full with jokes, and while the cast weren’t afraid to go for the laughs, sometimes the focus on the comedy aspect detracts from the realness of the situation, which some cast members are more guilty of than others. For me it is Jack Elliot as David, Rosie Milne as Dayna and Gillian Goupillot as Ronnie who are most impressive in maintaining the integrity of their characters throughout (while still being funny) and deliver fine performances. Jack Elliot’s script, while commendable in its weaving of different characters and perspectives, is structurally a little rough around the edges – comings and goings of each character could be have more significance, while the closely intertwined nature of the dialogue sometimes makes it difficult to follow specific streams of narrative and relationships. A few tweaks here and there could make it very special indeed. Catherine Exposito’s direction capably keeps the action slick, with respect to the light and shade required to keep the piece engaging throughout. Sometimes the staging and specific actions seem rather forced (I lost count of how many times a tablecloth was unnecessarily rearranged as a time-filler), so I would have liked to see the company use more creative ways to explore the natural “low” moments in order to maintain authenticity. Overall, it’s a very commendable effort from this young company – especially given the adaptability they have to perform in different venues each night as part of this, an extensive Scottish tour. Do try and catch it on one of their future dates if you can. Full details here.